This continues the idea mentioned in my Microsoft Future 2019 video post, where interactions should adapt to the type of activity, rather than the person adapting to the same type of interaction for every task. The 13 students designed and prototyped projects ranging from a special table for art directors to a lamp that receives and projects video messages from your friends. The projects addressed different affordances as well as the relationships between tangible, embodied things and their meta-data/meta-content. More details and links to project websites below the photos. All projects are working interactive demos that use the Make Controller in combination with our NET Lab Toolkit (Pen & Book didn’t use the Make). Focuses on the affordances of paper comps of magazine and other printed material. Each piece of paper is tagged, and acts as a vector into all of its versions, related documents, and relationships with the people and files that created the content of the page. By swiping the paper over different areas of the desk, the user instantly sees these different aspects of the page on a large screen. Reflects the activities of real-world magazine production. Paper, custom built table, Barcode reader, Wii controller, 50″ display, light sensors. 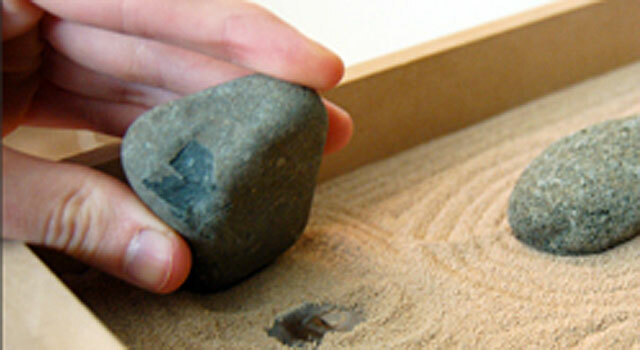 Plays with the idea mythical character of the stone by allowing people to lean down, pick up a one of several stones, and anonymously leave or hear and audio message. Small and large stones, $10 radio shack solid state recorders, switches. Explores and embraces the affordances of pen and paper by imagining simple, non-precious, mass produced and cheap digital pens and e-books. 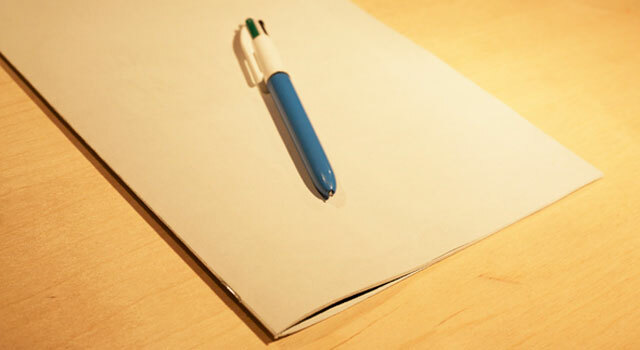 Enables the user to write on standard paper, yet instantly email the new document. Also, mark up a book and access the notes with any reader, anywhere. Paper, modified ball-point pen, Wacom tablets, projector, Flash, AppleScript. Inverts the “problem” of ubiquitous surveillance video, and demonstrates how people can access the histories of their own lives through the near future of continuous video capture of everything, everywhere. 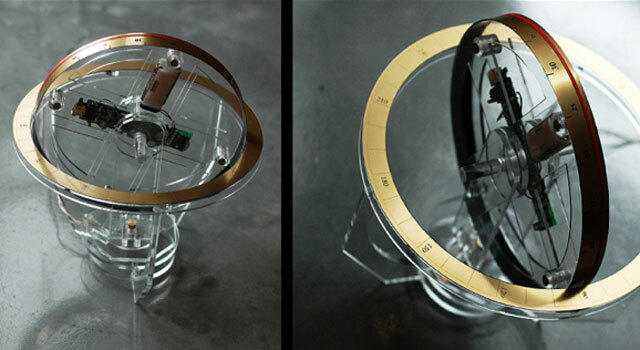 By rotating the two axis of the Astrolabe like object, one can dial in moments and locations of your life, seeing yourself from the perspective of a surveillance camera. Knob, Wii controller, video. A series of speculations (some mocked up in video scenarios, others prototypes) that explores ideas for applying some of the beneficial affordances of traditional mail and packages to electronic forms of mail. For example, in one of the working prototypes, an authorized friend is able to leave a video message for you and assign it to an object (e.g. a lamp) in your home. 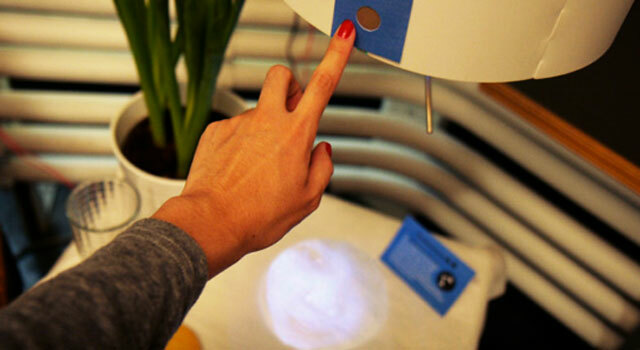 The lamp blinks when a message is waiting, and you simply touch the lamp see the video message played back in place of the light cast by the lamp. Micro projector, speaker, pressure sensors, two computers, Flash media server. A system that enables the shopper to rate and find more information as they shop. They can create different rating profiles for themselves, weighting sustainability, product quality, and social network criteria. It includes a portable and dressing room media component. iPhone with LiveView app streaming flash from laptop, proximity sensors, light sensor. 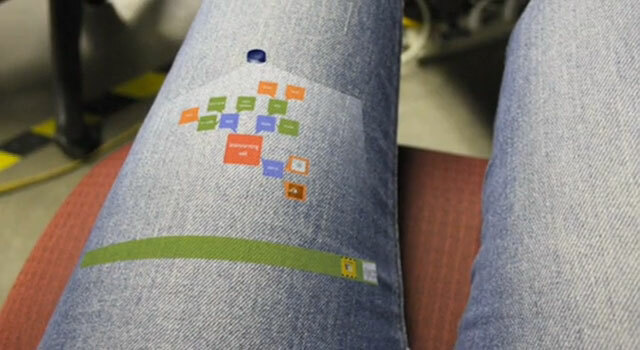 This project imagines a quarter sized projector that can be stuck to any surface (like your pant-leg) and turns it into a brainstorming area. Using a egg shaped object as the interface, the user can gesture to create a topic, manipulate media (e.g. scrub video), and make connections between ideas. Accelerometer, XBee wireless module, Wii controller in combination with Jonny Lee’s whiteboard software. By imagining a future startup company, this project uses a series of video simulations and working prototypes to explore how everyday objects can mediate communications and create new meanings in their surroundings. For example, the working prototype demonstrated how a user could read information on their coffee cup, transfer that article to another person’s cup, send secret messages, or seamlessly transition from the short version on the cup to a full version displayed on an e-paper table. iPod Touch with LiveView app streaming flash from laptop, pressure sensor, projector, knob.